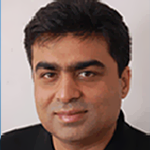 Mr Sachin Mehra has nearly two decades of experience in the communications business. Inventum is his fourth venture after a successful exit from Spectranet Limited, India’s first metro optical broadband provider. Prior to Inventum, Mr Mehra held leadership positions at ICICI Venture (India’s largest venture capital firm), Punj Lloyd Limited, Digital Future & T-Net. Sachin serves on the advisory board of several publicly traded companies & is a well-known figure in technology circles.